The importance of the Northwest Passage in the history of European and especially British expansion is well known. In the 40-year interlude of peace between Waterloo and the Crimean War, Britain could direct, with ease, a small portion of her fleet to polar discovery, and, by doing so, keep her Russian rival at bay, provide some employment and training for her officers, and contribute to the ends of science. Peard's journal of the voyage of Captain William Beechey , RN, and HMS Blossom to the Pacific and Arctic in 1825-8 is a lucid account of one of the most comprehensive British naval voyages to the Pacific since the days of Cook, Vancouver and Broughton. The Blossom made her way via Cape Horn to the Pacific, called at various places within the Pacific rim, and searched in vain for the expeditions of Captain William Edward Parry and John Franklin expected at the Bering Strait. George Peard, the first lieutenant of the Blossom, gives detailed descriptions of the places visited and the inhabitants, among them Pitcairn Island and the Gambier, Tahitian and Hawaiian groups. No less valuable are his accounts of Kamchatka, California, the Northwestern extremity of North America, and various parts of South America. Peard had an inquisitive, scientific mind, and he wrote a clear discursive narrative which shows that British exploration in the early Pax Britannica bore many fruits - scientific, commercial and strategic. 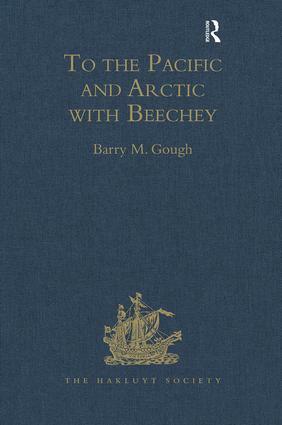 It also showed that the Northwest passage had again eluded the British, in spite of the careful planning of the Admiralty, the Colonial office and the Hudson's Bay Company and the painstaking execution of orders by such naval officers as Parry, Franklin, Beechey and Peard himself Two of the plates are now printed at the end of the book.